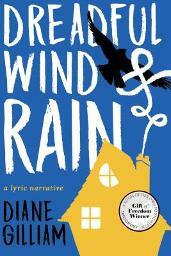 Diane Gilliam’s Dreadful Wind & Rain drops the reader into the story of a young girl and spans through her formative, marriage, and post-marriage years. In the early poems, the reader witnesses how the speaker is significantly damaged by the acts of others, particularly of those who should love and protect her the most (not excluding herself). The narrative moves in and out of the voice of a speaker named Leah, along with the Biblical Leah. Intermingled within are allusions to fairy tales and ballads, of which the collection takes its title, as “Dreadful Wind and Rain” is also a ballad about one sister drowning another over the love for the same man. This collection covers the psychological landscape of pain and betrayal, yet ends with self-empowerment. The answer to this question is an ongoing collection of images of what is done to Leah not only by her parents, but by her own husband and sister. In “The Naming of Scars,” the speaker describes both physical and psychological scars. An innocuous scar above the “right eyebrow / where I missed, getting into / the family car” to the more profound “glossy dent around the finger” that marks a failed twenty-five-year marriage where “. . .the husband and the sister / win,” to the final ominous stanza. The speaker is in the “waiting room” and instructed to “Mark in blue, . . . the places that are numb.” It’s no wonder that the speaker is numb. She is outshadowed by her sister, and unfulfilled by her desire to be visible to her parents, as revealed in the final poem of this first section where the speaker notes a single, all too brief instant: her mother gazes fully upon her only to turn “back toward the sun.” What is Leah looking for? asks her mother, “Anyone” she responds. the less he tells her about anything. She’s sure every night in the bed he lies. to who you were before. but she takes her place and she answers, Sleep. Diane Gilliam is the author of three previous collections of poetry: Kettle Bottom, One of Everything, and Recipe for Blackberry Cake (chapbook). She has received the Chaffin Award for Appalachian Writing and a Pushcart Prize. She is the most recent recipient of the $50,000 Gift of Freedom literary award from the A Room of Her Own Foundation. into the light. Let me do it. Let there be time. Allusions to fairy tales continue to unfold, ranging from a spinning wheel, the sorting of seeds, to an apple. In “The Apple” the traitorous sister appears with the fruit, wanting to be forgiven, but with the heavy handed, “if only you / would do / what Jesus would do.” The speaker is offered to “Take a bite,” but the apple is not eaten. In “Stones,” the younger sister appears “thirty years” later with her metaphorical bag of stones, “each stone / was a story she told about how she hadn’t really done anything / she had done.” As the younger throws stones at her sister’s windows, the stones only bounce back, as “the window was perfectly clear about who had done what,” and the sister has no choice but to leave, dragging her bag with her. Gilliam’s poems hang together by mirroring the speaker’s psychological growth, and supporting this emotional progression is the variety of poetic forms that she incorporates throughout her collection. Gilliam does not limit herself to one style; instead, free verse poems reside alongside more formal types like the formal villanelle (that aptly reflects on marriage). Likewise, poems from the Biblical Leah are formal in style, as their linkage to the Old Testament is weighty. However, intermingled are prose poems that reflect the speaker’s current situation, often by retelling or alluding to fairy tales, such as Snow White or the Handless Maiden. Regardless of form, Gilliam’s attention to sound and packed images welcome the reader back for a second and third reading. The emotional depths surveyed in these poems are rich, and the speaker tells her own fairy tale with a dose of realism that is, in the end, affirming to both the speaker and the reader.